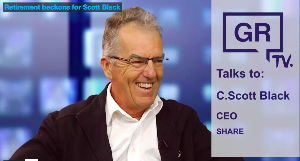 SHARE CEO Scott Black talks with Philip Macalister about the changes he has seen in the advisory industry over his long career. Good luck with retirement, Scott and Elaine- one of the few of us who made the sensible decision to get out with good health at an age when there is still time to enjoy heaps of life up ahead. Some good memories of so many conferences and locked horns in Pru/PAA joint management meetings, and we haven't forgotten how you nearly burned down our bach!